Clarion’s history is closely tied to the history of the automotive industry. Since the earliest days of in-vehicle devices, Clarion has consistently been an industry pioneer, launching Japan’s first car radio as well as Japan’s first car stereo. We identify drivers’ needs and support them through our technologies and know-how, while continually drawing on our abundant creativity to deliver unique products to our customers. Having progressed from simple radio and AV systems to car navigation systems and infotainment centers, the in-vehicle device sector has now entered a new era of change, filled with exciting potential. Reflecting upon this change, Clarion has evolved to become a full-service automotive-focused solution provider. You can track our progress here looking through our illustrious history of innovation and success. Established as Hakusan Wireless Electric Company in 21 Hakusanmae-cho, Bunkyo-ku, Tokyo; Begins manufacturing battery-operated household radios. Paid-in capital: ¥180,000. Merges with Takizawa Wireless Electric Industries Co., Ltd.; renamed Teikoku Dempa Co., Ltd.
Develops and launches Japan’s first car radio and bus loudspeaker device. Develops and launches Japan’s first car radio. Exports car radios to the US, creating the foundation for today’s car audio exports from Japan. Car radio receives genuine parts designation from Nissan Motor. Japan’s first car stereo developed and launched in August of the following year. Japan’s first cassette car stereo launched. Company introduces new trade name: Clarion Co., Ltd. Launch of the “Karaoke 8” karaoke machine for business, and the “Dubbing X” cassette editing deck. Clarion’s SS wireless modem is the first in Japan to achieve the official Certification of Conformance to Technical Standards. Simultaneous launch of the modem. ISO9001 certification obtained at all Clarion business sites. Launch of VICS-compatible car navigation system. In-car PC “Clarion AutoPC” jointly developed with Microsoft Corporation. Launch of the world’s first in-vehicle computer “AutoPC” in the United States. Electronic Toll Collection System (ETC) jointly developed with Hitachi Ltd. Launch of satellite radio receiver in North America. Launch of Japan’s first in-vehicle PC “AutoPC CADIASTM.” Windows CE for Automotive adopted as the OS. “Access Navi” adopted as the communication system. World’s first bird’s-eye view camera for car rear-view system supplied to Nissan Motor. . Launch of HDD (Hard Disk Drive) equipped AV car navigation system. Launch of HDD (Hard Disk Drive) equipped AV car navigation system, compatible with “CARWINGS” of Nissan Motor Information Service. Launch of world’s first in-vehicle information terminal with Linux and Java™ J2ME CDC for commercial vehicles. Launch of the industry’s first double-DIN, 7-inch monitor-equipped HDD AV car navigation system. Launch of the industry’s first bus FM teletext tuner used to display the names of stops along bus routes. Launch of the industry’s first AV center unit with iPod® control via virtual onscreen iPod “VRX755VD” in North America. AV-Navi System developed specifically for all Porsche Japan models. World’s first iPod-compatible integrated AV-HDD Navigation Unit launched in Japan. World’s first car navigation system for use in commercial vehicles “Solid Navi” (CQ–8000) developed and marketed. 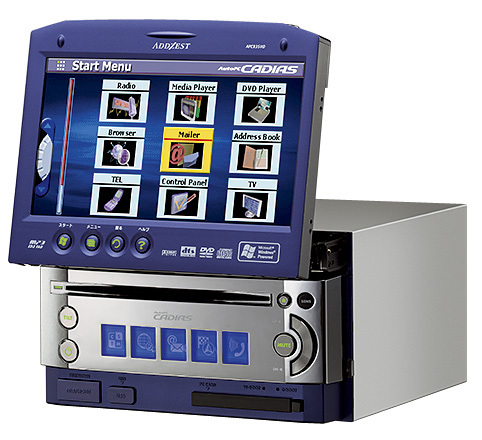 Clarion’s 7-inch wide DVD Multimedia Station “VRX935VD” and 6-disc DVD Changer “VCZ625” (both American market models) adopted by NASA and the International Space Station (ISS). SDD navigation system supplied for the first time to Mitsubishi Motors’ “i-MiEV” electric car. World’s first in-vehicle full-digital speakers developed. “Smart Access” cloud-based information network service for vehicles launches in North America. Launch of car navigation system compatible with “Smart Access” cloud-based information network service. Launch of “01DRIVE” series, world’s first Full-Digital Speaker System. Launch of navigation system supporting “cutting-edge cloud-based voice recognition search function”. Launch of “NX713” Smart Access link 7-inch VGA terrestrial digital TV/DVD/SD AV navigation system. Launch of two 2.4GHz digital wireless camera system models for commercial vehicles. Launch of “SurroundEye” safe driving support system for trucks and buses. Launch of navigation system supporting natural dialogue-type voice recognition technology “Intelligent VOICE”. Launch of “Medication Support Robot” as a device to support the elderly with medication administration, aimed at dispensing pharmacies and nursing care facilities. Launch of wireless IP services using industry’s first in-vehicle terminal integrating car navigation system and wireless IP functionality. Launch of “SOLID AD-1” Android™ in-vehicle terminal for commercial vehicles. Launch of industry’s first navigation system equipped with 7.7-inch screen. Development and release of a new Full Digital Sound System, demo exhibition held at the Frankfurt Motor Show. Launch of Full Digital Sound systems “Z3” ”Z7” and ”Z25W”. Launch of Full Digital Sound Headphones “ZH700FF”.